Perfect for a family vacation, or a great getaway spot with a few friends. Perfect for a family vacation, or a great getaway spot with a few friends who enjoys hiking, or just want to take in the beautiful views. Our welcoming Two Bedroom Red River Gorge cabins can accommodate anyone! 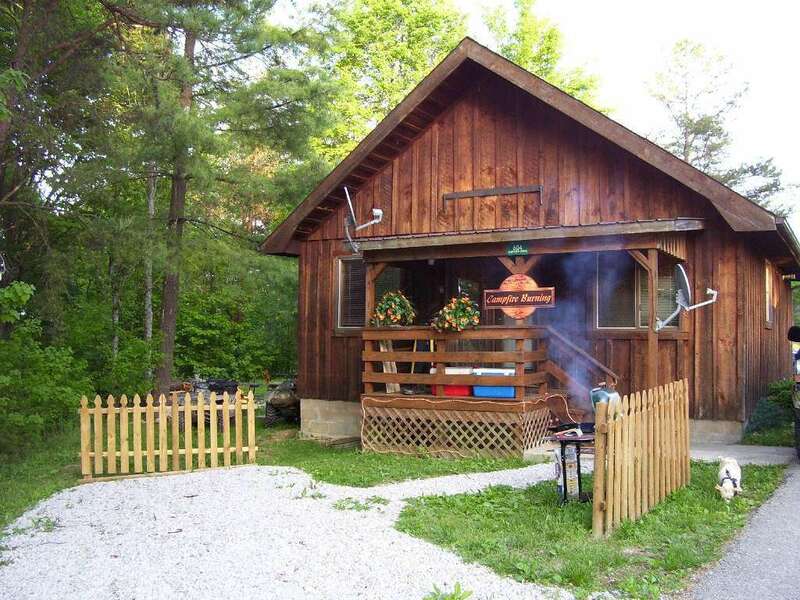 Modern 2 bedroom 2 bath cabin sleeps up to 7 people, has WI-FI, a bumper pool table and a foosball table, large flat screen TV with DVD player . Also has a washer and dryer, gas grill, and central heat/air. Master BR has a queen bed, upstairs BR has a full bed and 2 twins, and the downstairs den has a sleeper sofa. All will enjoy a great time grilling on the large wrap around deck with a view of a crystal clear 5 acre lake. This beautiful log home makes a perfect honeymoon destination. Fantastic lake view! This unique, small, 2-BR, 1.5-BA dainty cabin offers a hot tub, sauna, video arcade game consle, and large tv available for DVD's. Comes with DVD player. A tiny, secluded cabin with charcoal grill, wrap around deck with outdoor firepit. Sleeps 5 if use couch day bed. Located in a heavily forested, remote area offering privacy and all the comforts of home. Near Campton, Ky not far from Red River Gorge area. Two bedroms are private with a queen bed in each. One could also use the couch day bed if desired. The steps to the bedrooms upstairs are very steep, narrow and ladder like. (This cabin is not for elderly, people with mobility issues or young children). Must be agile and able to climb. But is the perfect cabin for pampering yourself and getting away from it all! We highly recommend checking-in before dark for this cabin, since it can be difficult to locate. This cabin has steps to the bedrooms that is a steep ladder and therefore not recommended for elderly, people with mobility issues or young children. Must be agile and able to climb to rent this cabin. Located in Cliffview Resort with all its amenities of fishing ponds, hiking trail, Zipline, restaurant. Warm yourself beside the gas fireplace inside or the secluded firepit out back. 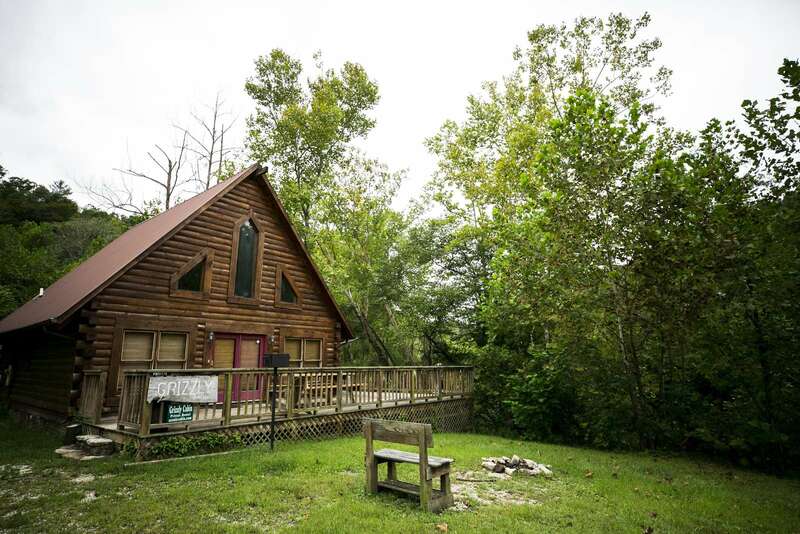 Campfire Burning is one of the easiest cabins to access in the gated Cliffview Resort community near Natural Bridge, Kentucky, with conveinent parking. New appliances and satellite TV allow for modern comfort with a cabin feel. Campfire Burning sleeps 6-7 people, has a nice modern bathroom, room air conditioners, full service kitchen and dvd/vcr & cd player for your entertainment. Master BR has queen bed, loft bedroom has futon and 2 twin beds. Couch is a futon couch. OUTDOOR HOT TUB SITS ON DECK IN BACK YARD. Charcoal grill outside. Visit for a romantic weekend or bring some friends to socialize and enjoy the beautiful, scenic surroundings. Nestled on 400 acres; this new, beautiful log cabin sits completely secluded in a wonderfully refreshing mountain site. A scenic creek runs next to and behind the cabin adding to the ambiance. Hike and explore all on your own. To top off your get a way a beautifully maintained horse farm is just a half mile down the road. 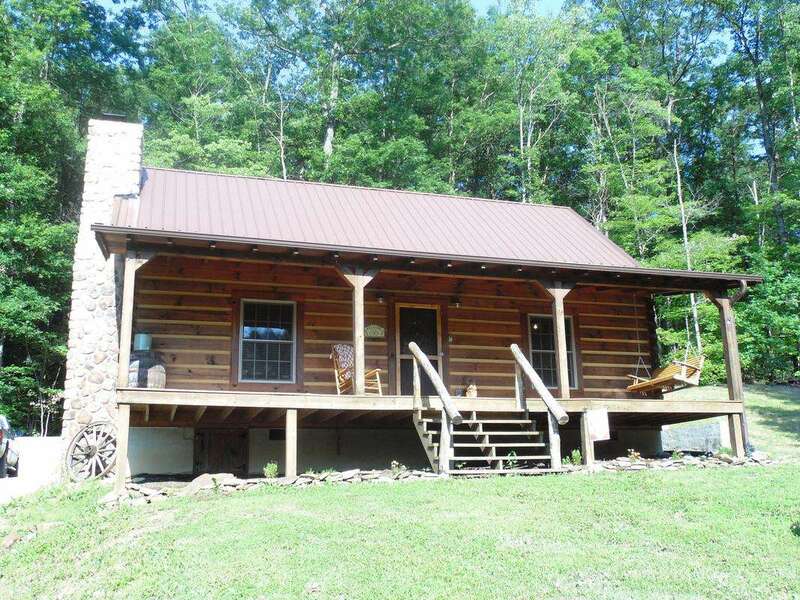 Cabin is located near Stanton Kentucky so you have easy access to town, groceries, stores, restaurants, etc. Just 10 minute drive to Natural Bridge & the Gorge exit. Cabin has all the great amenities of home including central AC/heat, satellite tv, Wi-Fi Internet, wood burning fireplace, modern appliances, outdoor hot tub in a gazebo overlooking the creek, porch swing, fire pit and gas grill. Has 2-BR, sleeper sofa & 1-BA. One BR has King bed and second BR has queen bed. 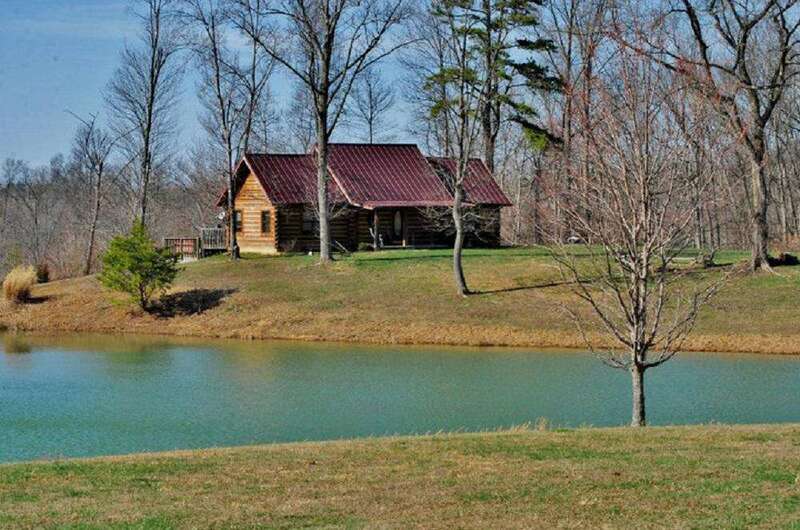 Cabin has horseshoe pit, corn hole game and hiking trails are available on this private 400 acres. This cabin is located on Hatchers Creek Farm about a 20 minute drive from the Natural Bridge State Park and Red River Gorge Area. Located in Cliffview Resort, this beautiful cabin features 2 private bedrooms with queen beds and has 2 full baths. The cabin loft also has a futon bed. The open living area has a gas fireplace, furnished kitchen with dining area for 6 on the main floor. There is a washer and dryer on the main floor located in the bathroom. One of the delightful features of the property is the large screened in porch with a picnic table and deck chair overlooking a pituresque view. The covered deck also features a porch swing, gas grill and inviting hot tub for soaking after a long day of hiking or climbing. Outside fire pit is a guest favorite. WIFI, Satellite TV/DVD, dishwasher, washer/dryer, central hvac. Chalet will sleep 6 and 7 if a child can sleep on the couch. Sorry NO PETS and NO SMOKING inside. Must be 25 years old to rent (person making reservation must be 25). 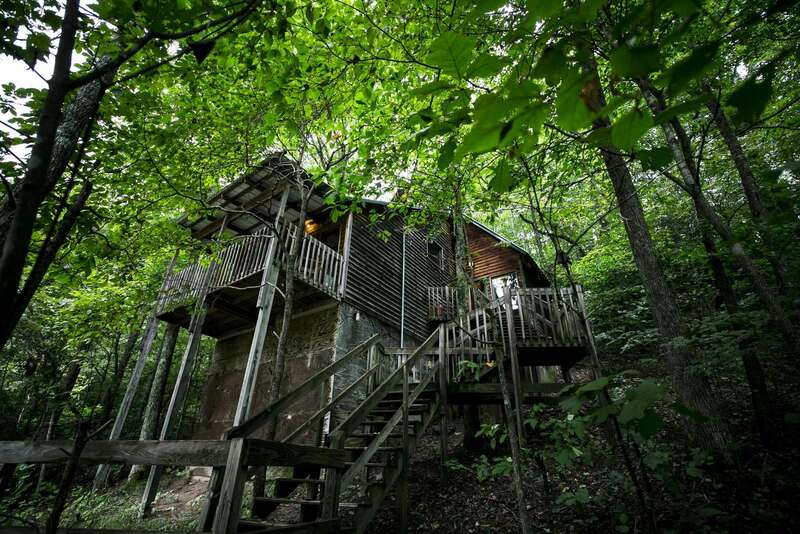 This charming cabin has 1 private bedroom with queen bed and a loft that has 2 more queen beds. Has 2 full bathrooms, electric fireplace, washer/dryer, central heat and air, dvd player, and charcoal grill. The main floor has the living room, kitchen with table, private bedroom, bathroom and laundry room. Upstairs is a large loft bedroom with a full bathroom. Centrally located to all the parks and hiking opportunities. Particularly close to Muir Valley and Pendergrass Murray climbing areas. We do recommend a 4 wheel drive vehicle or all wheel drive vehicle for this property. This cabin with lovely view comes with 2 private bedrooms, 2 full bathrooms with shower, air conditioning, central heat, satellite tv, outdoor hot tub, washer/dryer, vcr/dvd unit, & charcoal grill. One bedroom has a queen bed and the second bedroom has a full size bed. The deck has a hot tub and a nice picnic table enabling you to sit and enjoy the view. Other cabins on our site are nearby, within walking distance, so bring some friends to enjoy the area with you. After a day of excursions you can each return to your own comfortable retreat. Driveway is steep but there is parking available at top of driveway. Located in Slade, perfect location for Rock Climbers and hiker's splitting time between the Gorge and Natural Bridge State Park. Check out this delightful property, conveniently located next to Natural Bridge State Park and right on the Middle Fork of the Red River. Explore the creek it's shallow! 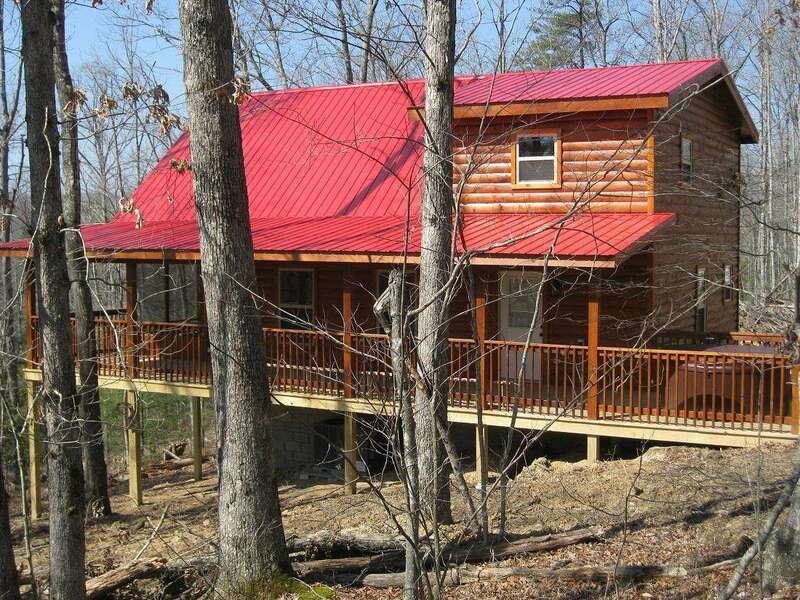 This charming log cabin comes with many amenities and is cutely furnished and decorated. Has pool table, hot tub, satellite tv, deck over creek! There are 2 bedrooms, one private on main floor and one large open loft bedroom upstairs; 1 newly remoldeld bathroom with tile shower on main floor, satellite tv, gas fireplace, pool table, outdoor hot tub, dvd unit & charcoal grill. Cabin has central heat/AC. Both bedrooms have a queen bed. It will sleep 4. The large deck extends around 3 sides of the cabin, has picnic table and is quite scenic as sits over the Middle Fork of the Red River. (Basically, river is a shallow creek in this region). Easy access, all paved roads to cabin. For long stays we can offer a laundry room associated with our motel, the Black Bear Lodge, located nearby on the premises. For larger groups this cabin is conveniently located near Bear Cub and the Black Bear Lodge motel. Features include leather furniture in the living room, satellite tv, internet service, electric fireplace, washer/dryer, outdoor hot tub, fire pit, and charcoal grill. Kitchen is recently updated with all of your basic needs including utensils, dinnerware, coffee maker, toaster, microwave, oven and more. The private downstairs bedroom has an authentic log style queen bed. The spacious loft bedroom features a king size Tempurpedic mattress to ensure you rest well after a long day’s hike. Several outdoor spaces to relax and enjoy the view including a private deck outside of the loft. Located on Slade Hill, just off Mountain Parkway, only 2 miles to Natural Bridge and centrally located to all the parks and hiking opportunities. Perfect for 2 couples or a small family. 4-wheel drive or all wheel strongly recommended as driveway is steep with a curve in the middle. There is a parking spot halfway up the drive if you want to park there and walk the remaining 75 feet (approximately) to the cabin. 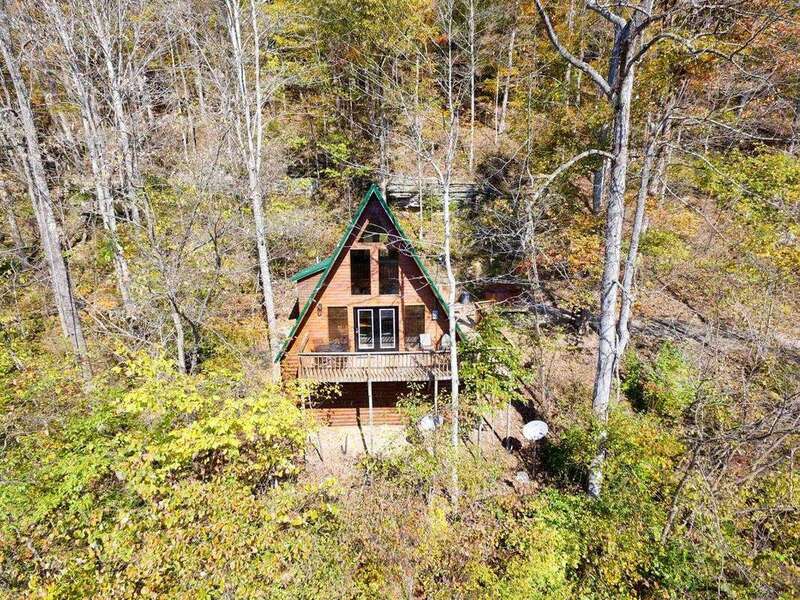 This comfortable, nicely decorated 2-BR, 2-BA rustic style cabin sits high on a high in Slade, Ky with a fantastic wooded valley view. Sleeps 4, each bedroom has queen size bed. Close to both Natural Bridge State Park and the Red River Gorge, this cabin offers hikers and explorers the perfect place to relax. There is a jetted whirlpool tub in the master BR to ease those tired muscles. Satellite TV, vcr/dvd provide nightly entertainment. A charcoal grill is provided for grilling out. Cabin has central heat/AC, gas fireplace, 2 showers, multiple decks. There is a trail and cliff wall behind this cabin with small cave. Great for those who don't feel like driving to find a place to hike. Road to cabin is paved, but is a steep drive uphill. Driveway is just a short gravel drive. There are numerous steps to get into this house so pack appropriately. Once you get in you won't be disappointed. One BR is on first floor and second bedroom is upstairs. Please bring your own charcoal to grill out or purchase upon check in at our store. Two bedroom cthat can sleep up to six. Master bedroom has a king bed and the upstairs loft has a queen bed and two twin beds. Quaint kitchen has stove with oven, refrigerator, microwave, and coffee pot. There is a washer/dryer, central heat/air and a wood burning fireplace in the cabin. Has a covered deck with bench, gas grill, hot tub, and outside fire pit. There is easy access to this cabin and it is not located on a cliff edge and there are no steep roads or road issues to get there. Cabin has 2 bedrooms and 1 bath, nice game room with full size pool table, outdoor hot tub, electric fireplace, TV with satellite in living room, TV in game room and master bedroom, dvd/vcr, central heat and air. There is a futon for extra sleeping in the game room for teens and kids. Game room has door to make it private if needed. House is best suited for 4 adults and kids. No parties or large groups permitted. Homeowners live across the pond should you need anything. 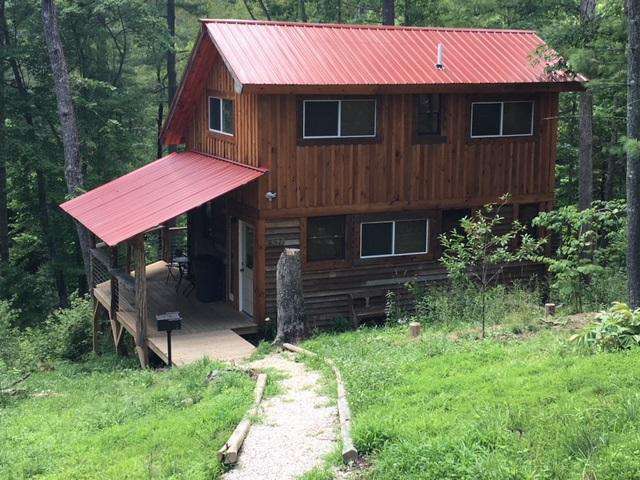 This secluded cabin with lovely view comes with 2 bedrooms, 1 full bath with shower and large 2-person Jacuzzi whirlpool, and half bathroom upstairs. Tee Pee has satellite tv, gas fireplace, outdoor hot tub, washer/dryer, vcr/dvd unit, outdoor fire pit & charcoal grill. One bedroom has a king size pillow top bed and the second upstairs bedroom has a full size pillow top bed. Both bedrooms have a tv. Great room has a huge sectional coach that opens to a queen size sleeper sofa; and large flat screen tv. It will sleep up to 5-6 if 1-2 are kids that can use sleeper sofa. New bumper pool table. The deck has a nice table and the outdoor hot tub to be able to sit and enjoy the view. Located in Paradise Valley community just minutes to Muir Valley, Torrent or Pendergrass. Only 10 minute drive to all the parks and hiking opportunities. Perfect for 2 couples or family of 5-6. Fantastic way to pamper yourself and relax before heading back to the city. Would make beautiful place to spend your honeymoon! 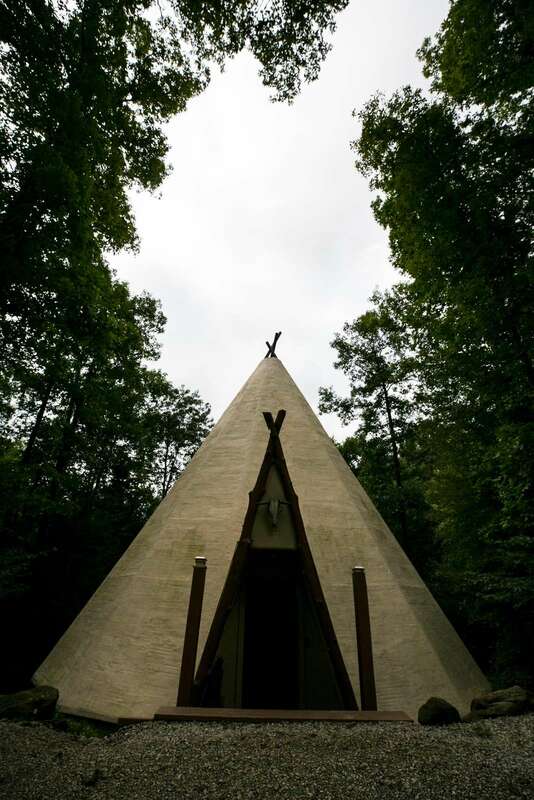 Come stay in the Tee Pee; it will be a lodging experience you will never forget! This cabin has well water, it is safe to drink but may have a sulfur smell. You may want to bring your own drinking water. There is a steep paved hill and gravel roads to get to this cabin so drive carefully. Charming log cabin sits completely secluded by itself near Nada Tunnel in Red River Gorge, Kentucky. Step back and relax in complete nature, serenity and seclusion without giving up the comforts of home. Scenic creek runs just behind this cabin with a cantilevered deck overlooking the creek (May be dry creek in dry summers). Cozy, secluded hot tub awaits you on the deck. Perfect location for those wishing to hike, fish and explore the Gorge, rock climb, or canoe. Close to the Nada Tunnel region, just several minutes from the Slade interchange. Pet Friendly. This 2-BR, 1-BA log home comes with WiFi, central AC/heat, satellite tv with movie and sports channels, outdoor hot tub, dishwasher, washer/dryer, charcoal grill, fire pit, nice deck, new furniture. Actually, is the only small cabin with both a dishwasher and washer/dryer! Downstairs BR has a king bed; the upstairs BR is a loft area BR with a queen bed and a twin bed. A well trained pet is allowed with payment of pet fee. PETS ARE NOT ALLOWED ON FURNITURE or BEDS or extra fee will be charged to your credit card. 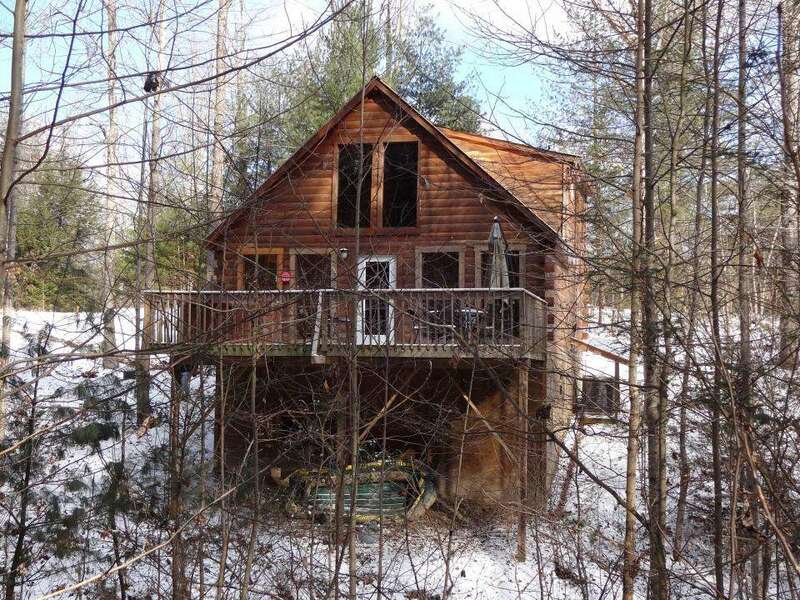 Looking for a new secluded log cabin in a heavily forested area?? Then this is your place! Located in Paradise Valley, Stonehill Cabin features a large bedroom separated by a half wall and screen to make 2 private areas, one and half bathrooms, lovely screened in deck to enjoy the outdoors without being mosquito bait. Cabin has central HVAC, satellite tv, wi-fi internet, hot tub, washer/dryer, full service kitchen with dishwasher, one and a half bathrooms, charcoal grill, electric fireplace & firepit. Bedroom is on second floor and has one queen bed on one side and a double queen size bunk bed on the other side (Bedroom does have privacy divider that pulls down from the ceiling). Lake is stocked for fishing, bring your gear and enjoy! WILL ALLOW A SMALL WELL TRAINED PET . Owner requests only dogs smaller than 50 lbs. Pet fee applies. WE HIGHLY RECOMMEND A 4 WHEEL DRIVE VEHICLE. Not motorcycle friendly. Cabin sits down a steep winding hill. The cabin's downstairs level has a full sized pool table with futon that sleeps two, electric fireplace, Smart TV with cable TV, chairs, stereo, games, and books to enjoy. The downstairs bedroom has king size pillow top bed and tv available for dvd's or games. There's also a roll-away bed for a seventh person if needed. The bathroom on this level has a large shower and laundry facilities. A private back deck with table and seating serves the downstairs level. The main level has a fully equipped kitchen and dining room with fabulous large windows to see the gorgeous view, and a great room with large Smart TV with cable TV. The main level has a bedroom with king size pillow top log bed and a master bath with over-sized jacuzzi tub and shower. Cabin has central heat and air. Outside the main level back deck is completely covered; has a hot tub, a large table and chairs for 6, and wicker furniture. The covered front porch is large with ceiling fan and 4 Adirondack chairs. There is a charcoal grill and a fire pit with chairs nearby. The cabin has well water, it is safe to drink or you may want to bring your own drinking water. Check out this lovely property close to Clay City, making it a shorter drive from Cincinnati, Louisville and Lexington, yet only 20 minutes to the Red River Gorge exit. This luxury log cabin comes with many amenities and is uniquely and cutely furnished and decorated. Notice the bear skin, buck heads, snow shoes and other unique items giving this a truly mountain feel. 2 bedrooms, one private and one open loft bedroom; 1 bathroom with shower and large Jacuzzi tub, satellite tv, wood burning fireplace, outdoor hot tub, washer/dryer, vcr/dvd unit, & gas grill. Cabin has central heat/AC. The main floor BR has a queen and upstairs loft bedroom has 2 twins. It will sleep 4. The front porch is covered so you can sit out in shade or out of the rain. A nice private patio with hot tub, love seat is behind the cabin. Easy access, all paved roads to cabin. Close to the Mt. Parkway Offroad Dragstrip. Enjoy stock car racing nearby. The spiral staircase to the upstairs bedroom is narrow so best for younger couples or kids. After a day of hiking and exploring, sit on the porch and enjoy the view or soak in the privacy of your own hot tub. You must be at least 25 years old to rent this cabin. 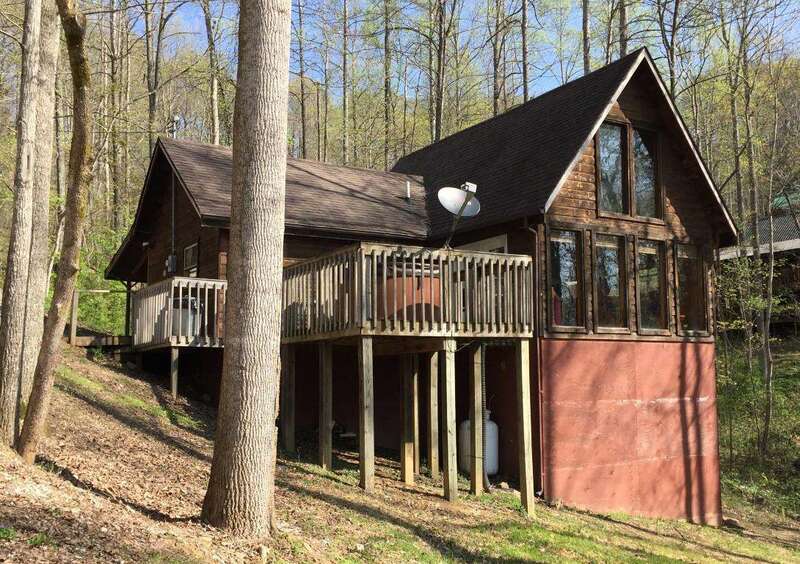 Nestled deep in the woods, this lovely 2-BR, 1-BA Cliffview Resort cabin, sleeps 4, overlooks a fishing pond with view of cliffs in background. Located off the beaten path with plenty of privacy in the gated community near Red River Gorge, Kentucky. Walk outside your door to stocked fishing pond. Has nice amenities with outdoor hot tub, satellite tv, dvd/vcr, central heat/AC, gas fireplace, gas grill. Has a great covered wrap around deck, providing shade on sunny days and keeping you dry on rainy ones. Sit on this deck and enjoy the fantastic view. Perfect for couples wanting to get a way or great to bring a couple of friends to share the fun. Each bedroom has a queen bed. Nice size bathroom with shower/tub. Outdoors, you'll find a nice firepit with chairs and great place to star gaze or roast s'mores. Scenic hiking trail nearby in Cliffview Resort along with Canopy Tree Zipline. Take a ride in the sky on the Zipline and soak in your own hot tub afterwards!